I’m a big believer in natural products and remedies. The more I learn about plants the more convinced I am of the idea that there’s one (or a dozen) for nearly every modern ailment. I started experimenting with essential oils, carrier oils, and natural remedies when I transitioned my hair almost 10 years ago. At the time, there weren’t a lot of good natural hair products on the market. Many of them were filled with silicones or mineral oils and did little to actually nourish or improve the condition of the hair. That’s changed, as the demand for products grew, but bang for my buck I still find most of the things that I mix up in my own kitchen to be more effective than much of what’s available off the shelf. Aztec Magic Healing Clay is a ‘what DOESN’T it do’ product that has been touted to the moon and back for its ability to absorb impurities, cleanse the skin, scalp, and hair, and getcha glow on (some people even EAT the stuff!). I’d used it previously as a clay mask for my face, but never on my hair or scalp. In the past, commercial shampoos often dried out my hair, but I would suffer it bi-weekly to clarify and remove product build-up. With this mask, stripping shampoos have been banished from my routine for good. Please Note: It’s a good idea to follow this treatment with a deep conditioner. So why is this combination of clay and vinegar so good for hair & skin? Bentonite clay is ideal for cleansing and detoxifying because it is negatively charged, or anionic. It has the ability to remove positively charged products that can build up on the hair and scalp like styling agents or conditioners while drawing out toxins, heavy metals, chemicals, and impurities. This allows it to cleanse and lift impurities from the hair and scalp, leaving it soft, clean and more defined. Apple Cider Vinegar or ACV is an antimicrobial agent, meaning it prohibits the growth of harmful bacteria. It can also ease scalp itching and flakiness associated with conditions like dandruff, psoriasis, and seborrheic dermatitis. In addition, ACV balances the PH of the hair strand and flatten the cuticle layer which increases moisture retention and leads to shinier, smoother hair. 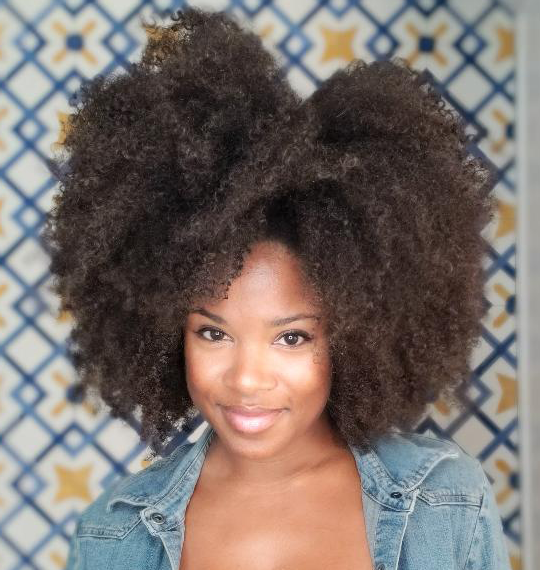 Some users have reported improvements in overall hair porosity. A t-shirt that you don’t mind getting messy. One section at a time, thoroughly dampen your hair. You want it wet, but not dripping. A spray bottle is helpful for this step. Cover your hair with your conditioning cap (I legit use a plastic grocery bag) and wrap that in a towel turban or t-shirt. This will help trap heat and allow the mask to work. If you have a hooded dryer, you can sit under that as well. Rinse thoroughly. It may take multiple rinses to get all the clay out. You can also add more oil or a co-wash conditioner to give your hair more slip and aid with the rinsing. Treatment is on, time to start the clock. Combined, the ACV and Bentonite Clay create a foam reaction. After mixing, your mask should be a thick, creamy consistency. After covering with a cap or plastic, I also wrap my head to hold in the heat and avoid drippies. Post-treatment, hair is soft and fluffy with good movement. Using more styling product would bring out more definition but I prefer volume. *The amount of clay (and other ingredients) you need for your whole head may vary depending on the length and thickness of your hair.